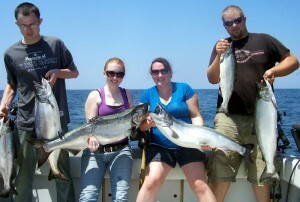 2012 Was a Phenomenal Season for Lake Ontario Anglers! The “1985-2012 Lake Ontario Fishing Boat Survey: Preliminary Summary for April 15-September 30, 2012,” just released by the New York State Department of Environmental Conservation, shows that the tiniest Great Lake’s world-class fishery is getting better from year to year. What makes these highly desirable results especially noteworthy is they come at a time when angler fishing effort is down considerably, “a 19.4 percent decrease compared to the previous five year average,” according to the report. Estimating the total off-shore fishing effort from mid-April through September at only “56,182 boat trips”, the survey breaks down the figures to 46,059 (82 percent) “targeting trout and salmon, which was the lowest estimated in the data series,…” and “6,203 boat trips targeting bass (11 percent of all fishing trips), the 2nd lowest on record.” The remainder of time was devoted to perch and other species. King salmon dominated (42 percent of the catch); brown trout came next (20.1 percent), followed by rainbow trout (16.8 percent), lake trout (11.3 percent), coho salmon (6.4 percent) and Atlantic salmon (0.3 percent). The smallmouth bass catch actually increased more than 80 percent over 2010’s record lows. Whatever the case may be, the survey’s results bode well for the Lake Ontario fishery off Oswego County. The Oswego River, Lake Ontario’s second largest tributary, runs through it, the Salmon River, the most productive salmonid stream in the lower 48 states, is spawned and pours into the lake in the northeastern corner, and several skinny creeks like Grindstone and Little Sandy water the lake all along the edges. And all of that water pouring in from Oswego County’s fertile landscape pierces deep into the heart of the lake, hooking the appetites of the pond’s largest denizens, drawing massive quantities into territorial waters from all points of the compass to bask, feed, spawn and hit the baits that anglers run through Oswego County’s fishermen-friendly waves.